…in Christ’s name, we have gathered to live a life of prayer. The Vine of Carmel as painted by Sister Marie Celeste. 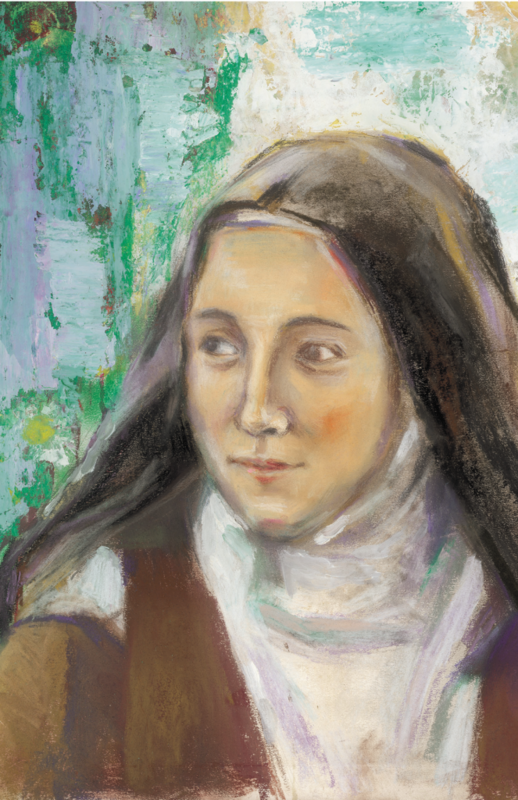 It was the apostolic love of our foundress, St. Teresa of Avila and her close companion, St. John of the Cross, that led to the reform of Carmelite life, which is lived in Reno Carmel today and in hundreds of monasteries around the world. Drawn by a similar desire to do something more with their lives, to impact our world in its deepest center for good, and believing that “prayer is the fulcrum that lifts the world,” women continue to respond to Teresa’s spirit giving themselves wholeheartedly to a life lived in “allegiance to Jesus Christ” in prayer. 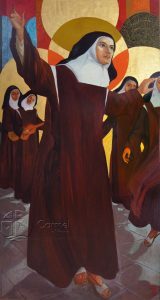 St. Teresa of Avila as painted by Sister Marie Celeste. Carmel’s life of prayer and our response to God’s call are lived out in the everyday circumstances of our daily community life. Our Rule exhorts us to give ourselves “to work of some kind.” Over the years, the Carmel of Reno has distinguished itself by the work of designing, printing and distributing cards around the United States and beyond. In addition to this, our daily activities involve cooking, cleaning, liturgy, bookkeeping, gardening, correspondence, hospitality, care for our own sisters and much more. 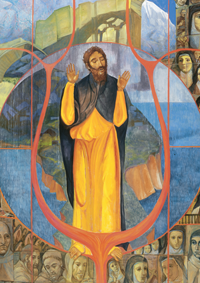 Each of us gives of her own talents and energies for the building up of the community, indeed for the building up of the Body of Christ throughout the world. Over the past decades we have embraced the call of the Second Vatican Council and continue to strive toward embodying its Spirit of shared responsibility in our community. In our weekly community meetings we listen to the voice of the Spirit speaking through each sister and, through this means, plan and implement decisions for our life as well as chart a vision for the future. Opportunities for faith-sharing on Scripture and our Carmelite life bind us together in love and in a common Spirit. We cooperate in the care of our earth through ecologically sensitive decision-making. Through means of on-going community dialogue we gently call each other to the living out of the Gospel values of compassion, hospitality, joy and solidarity with all. If you want to learn more about our life, please contact Sister Claire Sokol at claire@carmelofreno.net. “St. Therese” as painted by Sister Sa Ra.